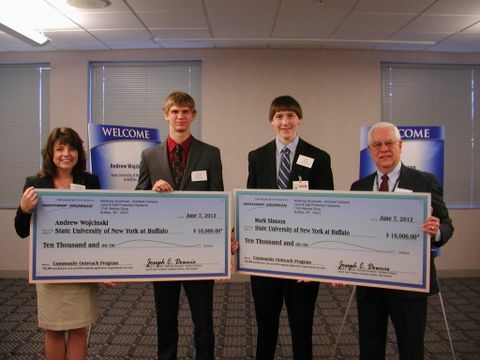 BUFFALO, N.Y., Aug. 14, 2012 -- Northrop Grumman Corporation's (NYSE:NOC) Amherst Systems business unit has announced the winners of its fifth annual Northrop Grumman Engineering Scholars program. The program awards two $10,000 college scholarships to local high school seniors planning to pursue a career in the science, technology, engineering and mathematics (STEM) fields of engineering, computer science, physics or math. Andrew Wojcinski from Lockport High School and Mark Simson from Orchard Park High School each received the $10,000 merit-based college scholarship â payable in $2,500 installments over four years â for their excellent academic achievements and community involvement. This fall, Wojcinski will study electrical engineering at the State University of New York at Buffalo. Simson is planning to major in computer science with an emphasis on software engineering and will also be attending the State University of New York at Buffalo. 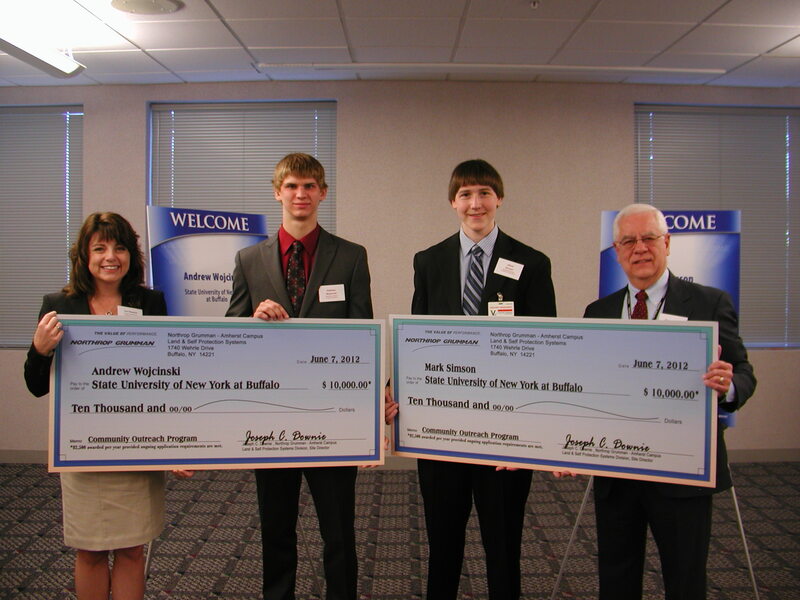 The students were honored at an awards breakfast in Williamsville hosted by Northrop Grumman on June 7. "Northrop Grumman is committed to providing support for continuing education in our local communities, especially in the areas of science, technology, engineering and math," said Joe Downie, site director of Northrop Grumman Amherst Systems. "Through this scholarship program, we are helping promising young adults interested in engineering careers achieve their goals." Northrop Grumman's Engineering Scholars program is open to promising high school seniors who plan to attend an accredited university or college as a full-time student in an approved engineering curriculum. Funds can be used for tuition, books, meals and lodging. A committee of Northrop Grumman employees selected the Engineering Scholars program winners. To be eligible, for the program, applicants must be graduating from an accredited high school in Erie or Niagara counties. Applicants must also meet minimum SAT/ACT and grade point average requirements. Additionally, the committee considered work experience, community involvement and extracurricular activities. Northrop Grumman is a significant financial and in-kind contributor to educational outreach programs aimed at encouraging young people to consider engineering and science-related career fields. More information about the Northrop Grumman Engineering Scholars program is available at http://www.es.northropgrumman.com/engscholars/ .